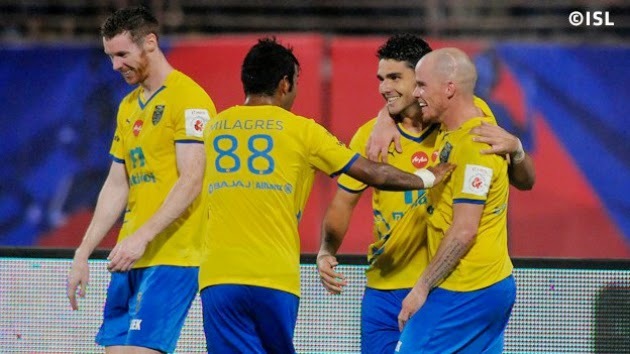 Kerala Blasters FC managed to pull off a hard fought 2-1 win against Atlético de Kolkata at the Jawaharlal Nehru Stadium in Kochi on Friday night. The hosts went two up in the first half through Iain Hume and Pedro Gusmão, while Kolkata’s top scorer Fikru Teferra pulled one back for the visitors in the second session. The match could have ended in a draw, as TV replays showed Luis García’s stoppage time shot had crossed the line after coming off the underside of the crossbar, but was not given by the officials.